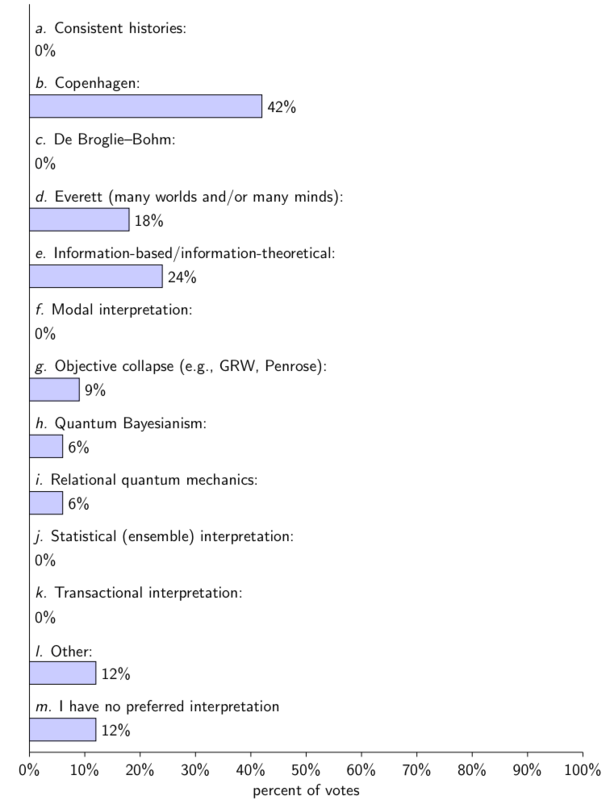 There’s a lot of variation depending on how the question is asked, but physicists overwhelmingly agree fundamental changes to our best theories are coming. Agreement on this comes not only from physics, but from those responsible for administering, planning, and what’s always a top priority: budgeting and allocating the $$$. These are no fringe elements; They advise the White House on science. Within the physics community the need for such change is widely acknowledged at every level and from various perspectives. What is unclear in these communities is how to use our resources to successfully bring about that revolutionary change in physics theory. That might sound good, but to mean much, we need to know what the PMI lingo “project requirements” means to us, relative to starships. We’re dealing with physics problems well known to many physicists and we’re trying to get requirements for a transformative solution, which is our goal. Something that enables faster than light technology would be very nice, but we’ll assume that revolutionary advances in theoretical physics will be helpful regardless of whether FTL is ultimately possible. Still, the combined strength of project management with physics doesn’t seem (so far…) to offer clear guidance on what we can expect a revolutionary paradigm to look like. That paradigm certainly needs to agree with all current data, our observations and measurements, but what’s missing? We know the revolutionary theoretical framework will resolve internal conflicts and problems physicists have raised, such as inconsistency between General Relativity and Quantum Mechanics. Our best descriptive framework: “the standard model”, has problems with what is called “explanatory sufficiency”, and even general descriptions of core fundamental concepts making up the standard model continue to remain out of reach. What is time? In the last ten thousand years, we’ve pretty much only learned that our observations for it’s measurement depends on relative velocity, and we’re not even sure about the definition of a reference frame from which we need a velocity to be measured. Whatever rough idea we hypothesize, it needs to have a possible domain that allows for us to observe and measure apparently conflicting data without insisting that reality actually is inconsistent, non-existent, unlawfully random, or infinitely exploding versions of multiverses. Brains in vats should also be ruled out. In project management, inability to resolve core uncertainties over time (and especially after spending lots of money) indicates an incorrect assumption in our approach; We’re proceeding with at least one belief (often unconsciously) that some circumstance is true and our knowledge of it is legit, it exists, but in fact it isn’t true or doesn’t exist. This at least gives us a place to start looking for what our deeper theoretical framework is certain to contain. There’s no guarantee we will succeed finding it…but we are certain to fail if we don’t look. Looking will take courage and be ego-bruising though. The standard model has such a history of predictive success, we’re emotionally invested in it, all the technology its enabled, and who wants to give that up? Fortunately, if the history of revolutions is any guide, we kind of don’t need to. After all, skeptics of the Copernican model claimed incorrectly that all sorts of predictions about sunrise and sunset explanations and predictions from geocentrism would have to be thrown out. With Darwin’s revolution, mackerel didn’t start giving birth to dogs with the acceptance of a common ancestry, contrary to what some religious groups still claim. What (if anything) does this tell us about the next physics revolution? It still seems like we’re lost in a maze. New mysteries that crop up at both ends of the cosmic size scale don’t help. We’ve got the sub-microscopic Higgs boson and paradoxical mass measurements for it on one hand, and unexplained and unpredicted dark matter and dark energy observations on the other end of the cosmic scale. Despite all the good stuff, if our models continue to predict results that turn out wrong, and we can’t explain or even define basic terms we use, yet we still claim to understand what’s going on with reality, how seriously should anyone take us? We seem lost, no matter how many decimal places our fancy theories predict to, or our technological gadgets measure. There is one thing in project management we haven’t yet covered, one of the most common and important recommendations in the PMBOK Guide: it’s to use experts and their knowledge. If we’re in the physics mindset, creating this revolutionary model seems like a physics problem and physicists are the experts. That’s true to a point, but incomplete. We want requirements for revolutionary theoretical frameworks in physics – a small difference perhaps, but it could be like the small difference between “lightning” and a “lightning bug”. If we don’t know of any other experts, physicists seem like the ones to ask. Actually, there are (little-known) experts in theoretical physics frameworks that create successful revolutions, or more precisely: there are two types of experts. Both provide useful info about those pesky anomalies in theory & observation from before and most importantly, where to focus our resources to make revolutionary success most likely. Historians of physics have identified characteristics associated with what worked for revolutionary advances, what didn’t, and misconceptions that can lead us astray. A common misconception is that great ideas come suddenly, in a flash of mystical insight. Then when we look at their notebooks however, their own handwriting shows a very gradual process of preparation and development. They can’t be lying – there’s no obvious reason to and plenty of motivation to brag about all that long, hard work. My favorite physics professor, David Goodstein at Caltech, said: “After we learn something, it’s almost impossible to go back and remember what it was like to see the world before we knew it.” And he’s right. So when we remember the struggle to learn something, we remember not knowing and then knowing. What might be decades of partial understanding virtually impossible to remember is washed away, and our brain fills in the gap. Myths from Archemides Eureka moment to Einstein’s shaving in the mirror confirm what’s been known for decades. Our brains can typically only remember an instant of recognition, so it fills in the blank with a mystical spark, creative flash, or dream…like thousands of times every day, when our brains fill in the time we close our eyes to blink as if it never happened, “confabulating” a continuous awareness we never actually experienced. Another misconception is the mystical nature of creativity or that its hard to define “a revolutionary theory”. Historically, when the conditions are right, several people tend come up with similar ideas at about the same time, like when Newton & Leibniz both developed calculus, several people discovered oxygen, and Darwin & Wallace both had the idea of evolution by natural selection at the same time. Just in mainstream quantum mechanics, there are 5 kinds of interpretation coming in a total of 14 flavors, and some interpretations of each allow them to be combined, while others tend to sit in opposition. All share the same data, and all have advantages as well as problems. Sorting out the principles by which we can distinguish which proposals constitute better science, better explanations, and more reliable theories is the domain of the second kind of expert we should work with: philosophers of science. Their community has studied the problems with dominant physics interpretations, and identified troubling, fundamental flaws awaiting a “New Copernican Model”. Physicists, administrators, government commissions, blue ribbon panels, organizational experts, historians, and philosophers agree a revolutionary transformation in our understanding is needed; And with a successful effort to produce that change, a new universe of discovery awaits us! In our next entry in this series, we will review some of the characteristics our future paradigm needs, enabling us to set a few preliminary requirements, provide traction for project management, and support better guesses which assumptions to look toward for candidate “deeper theories”.